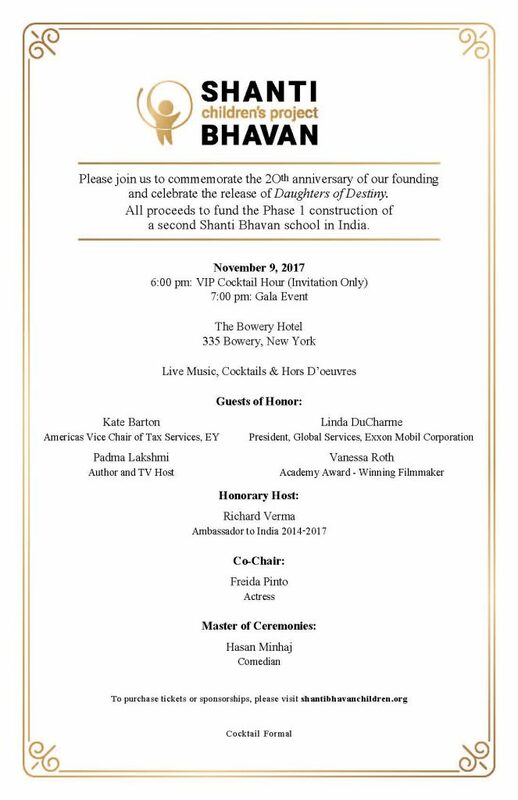 Please join me on Nov. 9 to celebrate the release of Daughters of Destiny and toast the 20th anniversary of our founding. Our goal for the evening is to raise funds to open our second school in India. You can help us build the next Shanti Bhavan by purchasing tickets and sponsorships to our gala here. Rather than buy a table at our event, I ask that you consider donating a classroom or even a building to our second school. As part of that gift, you will receive naming rights, VIP tickets to our gala, and more. Please find your invitation below.